Adirondack Chair cushions can be hard to come by but we manufacture awesome ones. 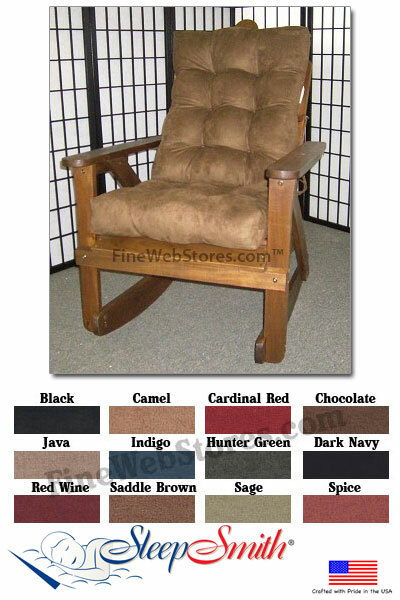 Our rocking chair cushions are made Micro Fiber Suede. Micro Fiber Suede is a soft great feeling fabric that appears to have the feel of suede without the cost and fragile nature of real suede. Cushions come with ties to secure to Adirondack chair. 95% of these ship within 10 business days plus transit time. FOR CLARITY SAKEThese are cushions only, you do not receive the wooden chair. They are subject to 20% restock fee. The Adirondack Chair Cushions Micro Fiber Suede is made from 100% poly fabric.